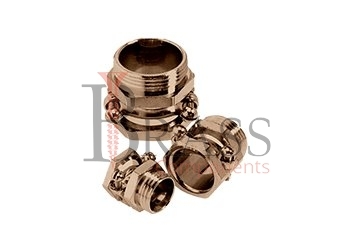 Strain Relief Cable Glands are manufactured from Nickle Plated Brass, Stainless Steel, Nylon, Brass or PVDF. The manufactured range of Strain Relief Cable Glands are compiled to meet the BS: EN 50262:1999 Standards. Strain relief cable glands are threaded and assembled in different ways. Strain Relief Cable Glands fulfill the highest demand of quality and security. The standard and high quality range of Cable Glands provide strain relief while ensuring integrity of any cable assembly, connection or installation. Strain Relied Cable Glands also provide sealing to the cables which prevent damages to the cables and equipment. Based on Cable Glands applications and requirement, Strain Relief cable glands are available with different types of cable gland accessories including earth tag, lock nuts, reducer, adapters, pvc shrouds, serrated washers and more. Help to protect the stress and damage as it runs through the panel of equipment. 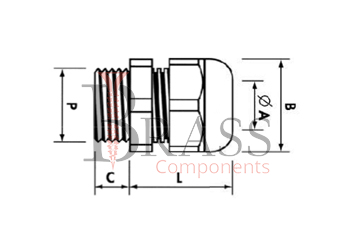 Available in different types of mounting threads including NPT, PG Metric and German metric thread. Available with IP68 Ingress Protection Rating. Heat Resistant and Temperature Resistant Cable Glands. Specialized Body styles area available for many different applications. CE, UL and cUL approved Strain Relief Cable Glands. Provide protection to the cables and wires by securing the cable of power cord. Does not retain oils, chemicals or bacteria. Installed in a threaded connection and exposed to elevated temperatures should be retained with a sealing compound. Avoid a loose connection when temperatures fluctuate. Widely used for Industrial Wires and Cable Protection. Provide superior Strain Relief and Environmental protection in any Industrial Connection. Ensure removal of strain from terminals and connections in various applications. Widely used in Automotive, Transportation, Security, Medical, Marine, Renewable and in Hazardous locations including oil & gas and many more. For any common wire termination into electrical boxes, control cabinets, medical equipment, data centers, solar combiner box and much more. We manufacture Strain Relief Cable Glands as per Custom Specification and export in Germany, Sweden, Denmark, Norway, Russia, France and other European Countries. For more Information, Please Contact Us or Inquiry Now.